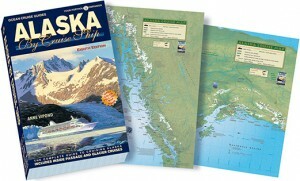 Alaska by Cruise Ship new 8th edition now in bookstores. Our best selling guide book to America’s biggest state is updated in the new eighth edition and is now available. This new edition of Alaska By Cruise Ship , covers all the ports from Seattle to Fairbanks and beyond with new focus on those who like get around independently. We’ve added new detail on our favorite hikes in Alaska ports and getting to the best attractions with the least expense. We have also included a large pullout map specially printed on heavy duty stock with Inside Passage cruises on one side and Gulf of Alaska cruises on the other. This map details cruise routes, distance traveled and annotated with notes about attractions along the way. This new edition not only gives you Alaska that way you want to see it with all color maps and photography but with insider tips to help you get the most out of your time in each port. Available at leading bookstores and online. Hawaii by Cruise Ship new 3rd edition now in bookstores. The new 3rd edition is finally available for cruisers traveling to this stunningly beautiful destination. 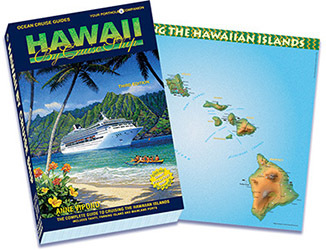 Several updates and revisions make Hawaii By Cruise Ship – 3rd edition an essential addition for this exciting voyage. The new edition of Hawaii By Cruise Ship , covers all the islands and ports with updates on getting around by rental car, the best beaches and updates on our hotel profiles at the base port of O’ahu. Extensive shore excursion updates and cruise-and-stay options are included, as are insider tips on selecting and preparing for your Hawaii cruise. Over 400 colour photos and dozens of colour maps detailing the islands, ports, whale watching locations and island attractions. Cruise routes are also shown so passengers can follow their ship’s progress. Comes with a large color pull-out map. This new edition also includes updates and coverage of the South Pacific and French Polynesia. 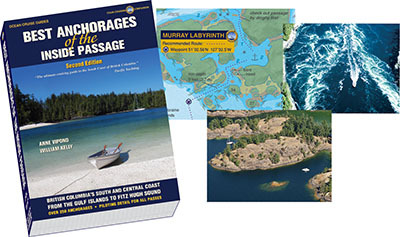 For yachting travelers to the Inside Passage, OCEAN CRUISE GUIDES has released the 2nd edition of Best Anchorages of the Inside Passage, the highly rated boating guide to the beautiful islands along the coast of British Columbia. 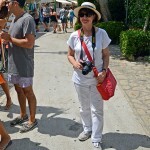 The book was published after more than 30 years cruising and researching this beautiful coast. This cruising book covers hundreds of secret anchorages from Victoria to Bella Bella and offers insider tips on cruising this beautiful coast including piloting detail on over 30 passes. Includes new chapter on Fitz Hugh Sound. Over 500 color images with 100 stunning aerial photos and over 120 detailed maps of the anchorages and passes. ISBN 978-1-9277470-1-8, retail price $39.95. Caribbean By Cruise Ship’s Seventh edition updated with expanded detail on the Western Caribbean cruises. This guide has been used by Caribbean cruisers for over 15 years and covers ports from Florida through to the Eastern, Southern and Western Caribbean. All new color maps and color photography throughout help readers make the most of their time in the exciting ports of the world’s most popular cruise destination. Updated cruise glossary. The new sixth edition of Mediterranean By Cruise Ship is now in stores. This edition has a new pullout map at the back of the book and has been updated with more detail on secondary ports, updated destination images and updated cruise line glossary. The Mediterranean is perhaps the most interesting of destinations from the aspect of western history and culture and a cruise is the best way to experience these famous cities within a short period of time.